It may sound cliched, but Anathem is one of love-or-hate types of books. In fact, I'm fairly sure it's in the handbook. And I love it. But I can well understand how many won't - for one, its slow pace and presentation of setting will certainly leave some frustrated. Then there's the size, of which a sizeable amount is pure - yes, you guessed it - dialogue. But despite this, Anathem is an epic. But not in the usual sense. Anathem is set on the planet Arbre, an Earth-like planet whose development simply - stopped - around the year 2000. Intellectuals remain cloistered in "concents" - austere and secular monasteries, that have been sacked three times prior to the time in which the book is set, each time becoming more and more austere. The avout are forbidden to own more than the necessities - the bolt, chord, and sphere - and are forbidden access to any technology. This is handled by a separate caste in the concents, the Ita. But now, travellers from Arbre's parallel worlds are visiting - and the "Saecular Power" needs the avout. Weighing in at around 930 pages, Anathem is a hefty one, and much of this is taken up by musings, in which the avout present advanced (and intriguing) ideas, philosophies and theorems - some remarkably similar to Earth's. This, too, becomes a central theme in Anathem, as the concept of the "Hydlaean Theoric World" gradually unfolds. But Anathem's message isn't just in dialogue. The underlying tone of the book is one of suppression, and the bittersweet ending concludes this perfectly. My conclusion: Anathem is a daunting prospect, but well, well worth the effort. I'm near the end of Quicksilver right now. 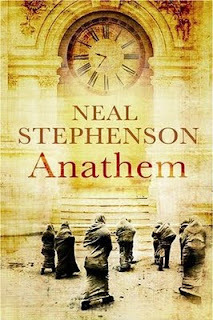 I am really looking forward to starting Anathem just because it has monks, math, worldbuilding and Neal as the author.